Some moments get a lot of hype. In 2012, Peter Parker “died” within the main Marvel universe. In early 2013 Damian Wayne the current Robin in the DC universe was killed. I apologize if I spoiled something for you, but both of these story arcs led to major news coverage in the mainstream media. Yet, I heard nothing of something I believe is a major shift in the Marvel universe from 2011. Marvel released a miniseries titled Battle Scars written by Christ Yost, Cullen Bunn, and Matt Fraction. Seriously you may have never heard of this series, but you need to S.H.I.E.L.D. fans, because in its conclusion the Marvel print world and Marvel Cinematic Universe were reconciled. When you reach the end, Nick Fury in the print world was African American and stylized after Samuel L. Jackson! The trade paperback Battle Scars collects all six issues written by Yost, Bunn and Fraction and illustrated by Scot Eaton. The story follows U.S. Army Ranger Marcus Johnson, whose mother an “innocent” school teacher is killed while he is serving overseas. When Johnson returns for her funeral he discovers that he has a bounty on his head and some of the world’s most dangers assassins including Taskmaster and Deadpool are looking to collect, dead or alive. Though put under the protection of S.H.I.E.L.D., Johnson escapes their custody to solve the mystery of why someone killed his mother, targeted him, and the identity of the father he never knew. While on this journey, he is assisted by a fellow Ranger named Cheese. The two ordinary men bring their training and friendship into a world of superheroes and super villains. 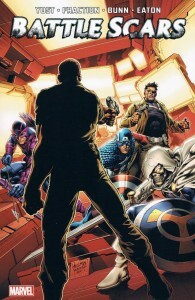 By the time the action packed story concludes, the image of Nick Fury is reconciled with the Marvel Cinematic Universe. I enjoyed this story. I did not pick up the trade thinking I would need to think deeply. What I was hoping for was escapist adventure, and the creators delivered that in spades. This story is full of action. It is really fast paced. And you come to sympathize with Marcus as you want to help him uncover the mystery around him. Because I had seen much of the plot in Internet searches earlier I was spoiled to some key point story points and reveals. But I still wanted to keep up with Johnson as he uncovered the mystery surrounding his life. Additionally, I really liked the character of Cheese. Though he lacks flash, his skill and loyalty shine throughout the story. Again, minor spoilers, at the end of this issue S.H.I.E.L.D. gains two key agents. The first Nick Fury Jr., is an African-American with an eye patch and movie matching scars. If anything the biggest difference between this Fury and the movie version is a Captain America stylized uniform, a gift from Cap himself. Additionally this Nick Fury Jr. is a field commander not the Director of S.H.I.E.L.D. This role is continued into the Secret Avengers series, which launched in 2013. The other agent is Phil Coulson, suit and all. The writers make it clear that this version of Coulson is a highly trained fighter, who is as expected a Captain America fanboy. We get glimpses of Coulson in this book in the midst of firefights and the reader understands he is a man of action. I like how he is depicted here more than Secret Avengers where he seemed more like a salesman than a hero to me. I would say if the Marvel Cinematic Universe was able to develop the Fury/Coulson back story that we find in Battle Scars, Coulson’s temporary final act in The Avengers would have even more impact! I believe that this is the sort of Coulson many of us hope to see on ABC; strong, loyal and able to handle himself in a tough situation. Marvel has reconciled itself. No longer is the Nick Fury of the Marvel print world an old crusty Caucasian. He is now an African-American, who looks like a younger version of Samuel L. Jackson. I think this is a good move for Marvel as it may help bring movie fans to the comics. I just don’t understand why more was not made of this as help spread the word, Agent Coulson is in the comics and has a back story!